Napoléon François Charles Joseph Bonaparte (20 March 1811 – 22 July 1832) was the son of Napoleon and Marie Louise of Austria. 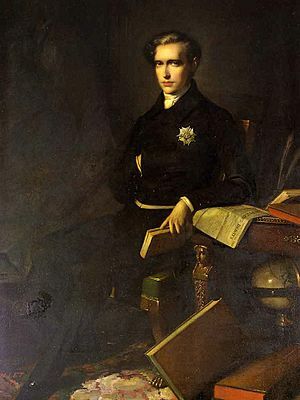 Napoléon II was born in Paris in 1811. In 1814, Napoleon I was defeated by the Sixth Coalition and then forced to resign by his own officers. Napoleon I originally wanted Napoleon II to succeed him, but this was rejected by the coalition. Napoleon II and his mother went into exile in Austria, while Napoleon I was exiled to Elba. In 1815, Napoleon I escaped and retook control of France, but was forced to resign again after his defeat at the Battle of Waterloo. Napoleon was arguably the Emperor of the French in late June and early July 1815. Napoleon spent most of his life in Austria, where he was known as Franz. He became the Duke of Reichstadt at the age of 7 and joined the Austrian Army at the age of 12. Napoleon enjoyed a close relationship with Princess Sophie of Bavaria. It has been claimed that he was the father of Sophie's son, the future Maximilian I of Mexico, but this is widely rejected by historians. Napoleon died of tuberculosis on July 22, 1832. In 1940, Adolf Hitler had Napoleon's remains moved from Vienna to the dome of Les Invalides in Paris. His remains were buried next to his father's for some time, but were later moved to the lower church. Napoleon II was also known as "The Eaglet" (L'Aiglon). Edmond Rostand wrote a play, L'Aiglon, about his life. Serbian composer Petar Stojanović composed an operetta about him in the 1920s. Arthur Honegger and Jacques Ibert worked together on an opera, L'Aiglon, which premiered in 1937. The journalist Henri Rochefort joked that Napoleon II, having never really governed, was France's best leader, since he brought no war, taxes or tyranny. Napoleon II of France Facts for Kids. Kiddle Encyclopedia.